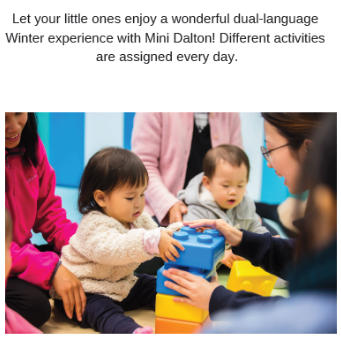 Mini Dalton is proud to present Winter Camp 2018 at our West Kowloon Campus, running from December 17th to the 21st, for Playgroup and Kindergarten children. Bring your little ones to our camp for a week of winter themed fun games and activities! Sign up now by going to our Application Form page.